Eco-hotel Friend House is located on 3 hectares plot in forest resort zone aside of Orel river bank, 30 km far from Dnepropertrovsk. It is a single-floor group of buildings with open yards, parking, terraces, garden and park zones (covered area 1750 square meters). During process of siting, an ineologycal analysis of the region was used, taking into account Earth energy information field conception. It is space, reflected in details, surrounded by wildlife. 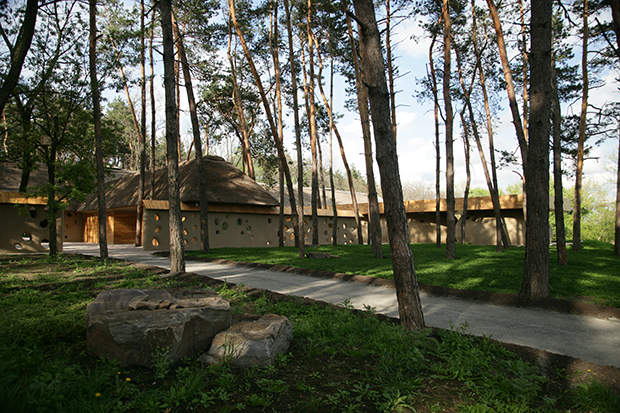 In this project were used exclusively ecological harmless materials: clay, reed and wood. Construction s carcasses designed from wood and shell stone. Cobwork cocoons of room are united by the roof plate. All furniture and lighting are designed by project manufacturing company Ryntovt Design. Intercommunicating with an environment with forest, river, the ecocover of the buildings is in morphogenesis with natural landscape. Another distinctive feature of this ecohotel is an apple tree garden. According to a beautiful local legend, a good farmer should necessary invite guests twice a year, first time during garden blossoming in spring and second time on Transfiguration Day, the lightful holiday. during gathering apples in summer.